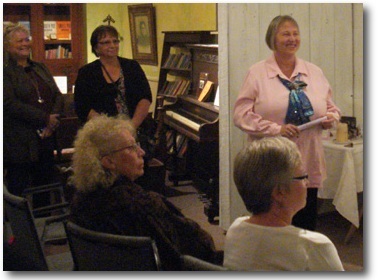 Local poet and inspirational speaker Sharon Sinclair delighted her audience at the South Grey Museum recently with stories of local people and poems from her travels. Sinclair was raised in Ceylon, Ontario, but worked in Toronto for many years before returning to Grey County. She now resides in Kimberley, where she lived as a commuter when she worked as a teacher and was considered the “poet in residence” at Albion Heights Junior Middle School in Rexdale. It was a long cry from the one-room school house she was taught in, but it informed her poetry and her life just the same. From her history and work with young people, Sharon created three CDs of poetry for parents and teachers to inspire them to engage young people. Good Luck…Little Duck offers poems for children. Tales From a Teacher has background stories to poems about important life events and experiences. Then there’s Queen Quenella’s Kingdom: The Story of Alphabet Alley, which became a mainstay as she taught youngsters how to like their words with the sounds they make. Many teachers still use this story for teaching sound-symbol correspondence, thereby giving children the skills to express their own ideas in writing. An excellent speaker with a familiar presentation manner, Sinclair showed her talent for storytelling as she regaled the over 20 people in attendance with tales of early Ceylon, her ancestors, life as a teacher and the wonder of coincidences she often celebrates with her poems. She remembered the significance of the appearance of a rainbow to remind her of life’s grace. From her CD and booklet Water from the Moon the poem “City Car, Country Car” details the lucky happenstance of her local car dealer, Randy Boyd, appearing on the scene minutes after she struck a deer while driving into the Beaver Valley on an inky black night. His business card was in her hand but her phone was dead. Bringing along her own family heirlooms and artefacts from her past, she displayed images of her parents and grandparents on the Flesherton Station ticket wicket, run by her grandfather who was the Flesherton station agent for nineteen years. Sharon spoke of her love for this area and how important it has been to her – forming her into a caring and nature loving adult. In her winters spent away in Fairhope, Alabama, she writes her Carpe Diem Chronicles, named after the motto of the historic and now gone Flesherton Highschool. Book One was inspired by sunrise reflections watching the waves of the Gulf of Mexico flow into her life. The first edition of this latest project was launched as part of this exceptional evening of poetry and remembrance. Sinclair’s CDs are available at the South Grey Museum or by contacting the poet directly. She is always encouraging fellow writers through workshops, her poetry club "Precious Gems" and her website at www.poetryspeaker.com. If you are seeking your own inspiration, this might be a good place to start. I have been blessed to meet an outstandingly talented individual who has recently shone her luminous light upon my pathway. Erika Harris of lifeblazing.com is blazing a trail of compassion and spiritual growth with her many initiatives. Please visit her site for more information. Prepare to be amazed!! I was very pleased on November 26th, 2010, to be her invited call-in guest on the blogtalk radio show she hosts called “The Listening Show”. Click on Episode #7 where you can listen to the interview in which I was privileged to participate. On November 20th, 2010, the Christmas Stop and Shop in Flesherton, Ontario, provided a welcoming venue for launching my CD and book, “Water From The Moon”. I was delighted to share a table display with my good friend and associate Donna Mann, who is an award-winning author and accomplished musician, among her many other attributes. It has been my honour to be the first narrator of Donna’s children’s stories which can be found at meadowlane.homestead.com.